The official birthday of Queen Elizabeth II is marked each year by a military parade and march-past, known as Trooping the Colour (Carrying of the Flag). 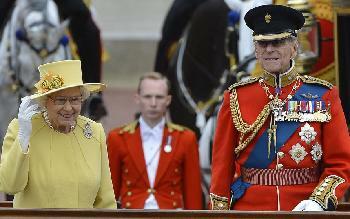 The official name is “the Queen’s Birthday Parade”. Each June, the Queen and other members of the Royal Family attend the Trooping the Colour ceremony on Horse Guards Parade, Whitehall in London. The Queen attends the ceremony to take the salute from thousands of guardsmen who parade the Colour (their regiment’s flag). It is only the Foot Guards of the Household Division that take part in the Queen’s Birthday Parade, with the exception of the King’s Troop Royal Horse Artillery, (based in St. John’s Wood). The Kings Troop, parade round with the Household Cavalry after the Foot Guards have trooped the Colour in slow and quick time.